The Lower Back carries feelings of being unsupported financially and/or emotionally. It is also where we hold feelings of wanting to “back out” of relationships or situations. If you suffer from lower back pain, think back to when it began. What was going on in your life at the time? Lower back pain often coincides with anniversaries, birthdays, retirement or even children leaving home. These occasions confront us with our own mortality and can bring up deep layers of fear and insecurity about what lies ahead or about our standing in life. To get the very best results from this transcript, suspend your disbelief for a little while. Ignore that insistent voice which says “this is not true”, “this is not how my body really is”. It takes time and repetition to change habits and beliefs which are rooted in the subconscious mind, so be patient with yourself. The best time to reach and reprogramme the subconscious mind is when you meditate, daydream or are deeply relaxed. With every breath I take, I am sending love, gratitude and healing to my lower back! I release any financial concerns, I have stored in my back! I release any energy that’s pushing in to my second chakra! I release any and all relationship issues, I have stored in my back! I release all responsibilities, which are not mine! My sacrum and coccyx are strong and healthy! I am sure footed and step forward confidently! I have a secure foundation! Why am I completely free of the belief that I have to hold everything and every one in my life up? Why do I know now that nothing is going to collapse without me? Why is my center of gravity so secure and powerful now? I am assertive and confident! My self worth is growing steadily! I am completely safe and secure! I easily face any situation in my life! Good, healthy, energy flows though me easily! I feel free and light! I am happy and healthy! Everything in my life flows, easily, gently and gracefully! I am stable and poised! I am more than up to any task! 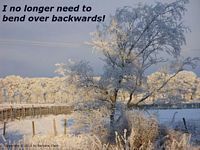 I no longer feel the need to bend over backwards! I no longer have to put my back in to it! I can safely rely on myself now! I let it all go!! Because our backs carry so many emotional issues for us, the healing guided meditations for the back have been divided into three parts. Get our three back meditations in a single package, at a special price of only $19.98! My spine is in perfect alignment! I easily stand up for myself! Do You Have A Bad Back? After my article, Are You Burying Your Head in the Sand?, was published many people asked how they could get themselves out of the way and allow their bodies to heal. How could they connect, appreciate and love their bodies more? We are all unique and there is no one definitive answer. I hope this article provides a bridge to help people understand the importance of self-talk and beliefs, and move towards having a more loving, appreciative relationship with their bodies. Much has been written about the interconnection of emotion and physical dis-ease. And, although each of us is unique, it is possible to generalise where a particular emotion will manifest a physical symptom if it is not dealt with. Our language gives us clues as to the truth of this. For example, have you ever said, “So and so is a pain in the neck”? Or “He/she has the weight of the world on his/her shoulders”? Dr. John Sarno MD, a traditionally trained professor of New York University School of Medicine, came to the same conclusion. After many years of treating patients with back pain using standard remedies, he continued to get lousy results until he realised that 88% of his patients also had stress-related problems. When he started to teach his patients that tension, not structural problems, was to blame for their pain, he started to see good results for the first time in his career. Andrew Weil MD, also traditionally trained, calls himself, “a great believer in Dr Sarno’s ideas”.